Have you ever wondered why can’t you lose weight despite exercising? It might just be your diet and sugar intake that’s to blame. It’s because all the present sugar in the food that you eat affects your health and makes you gain more weight. Though it may sound impossible to ditch on your diet, I’ve found some simple ways to cut them down and eventually get rid of them. Down below is a list of smart and simple ways to stop out your sugar intake. They’re easy to implement, give effective results, and will make your life so much easier. So check them out and let me know what you think. Though processed food offers convenience, these foods are horrible for your diet. They have a large amount of sugar content that can help you gain weight. Also, they’re full chemicals that might harm your health as well. So the next time you do your grocery run, avoid these products and opt for whole foods. Not all sweets are terrible. Some of them are naturally good for your body and are super healthy. Choose a sugar alternative that gives the same sweetness but cuts out the sugar intake. Try using raw honey, dates, xylitol, coconut sugar, or stevia for a better option. They taste great and are perfect substitute for regular sugar. Don’t just count the sugar in your coffee, juices, or sodas but other (supposedly healthy ) food like yogurt too. Flavored yogurt may come in a wide variety of mouthwatering fruity flavors but compared to the ingredients of regular yogurt, they’re much higher in sugar content. They don’t always contain real fruit, but have a pureed form which is responsible for the high sugar intake. Whenever you want to buy any food, make it a habit to check its label first before heading to the cashier. Knowing its ingredient list will let you know how much sugar content they have and other unwanted chemicals that are bad for your body. In this way, you can easily figure out which one is better and healthier to eat. Treat your body to the natural benefits of whole foods and indulge in vitamins and nutrition. Eat more vegetables, fruits, seeds, legumes, leafy greens, plant-based proteins, and other whole foods rather than processed foods. Also, instead of getting flavored juice which are high in sugar, try to make some fresh fruit smoothies. They taste amazing and have less sugar. Sugar can hide under some sneaky names. They often use added sugar names like fructose, corn syrup, molasses, agave, maple syrup, and more. If several sugars appear on the label, it’s an indication that the food is less healthy than you may think. One of the easiest ways to cut down on your sugar intake is by keeping all your sweet treats away from your house. This includes your all-time favorites like Oreos, chocolate bars, gummy’s, candies, and ice cream. If they’re within your sight, chances are you’ll forget your no sugar diet. So get rid of them and stockpile your pantry with healthy food. Though some soda companies offer diet, zero sugar, or a light option, these are still artificial sweeteners that contributes to your weight gain. So why not try some freshly squeezed juice; it’s a better option and easy to prep. Also, why not trade your soda in for lemon and water infused drinks. They don’t contain sugar at all and help you lose weight. Chocolate is a favorite of many, and dark chocolate is such a great (and tasty) alternative to milk and white chocolate (in moderation of course). Grab some when you’re hungry and you’ll appetite will be suppressed. The bittersweet taste of pure dark chocolate helps in suppressing appetites which will keep your cravings at bay. Whether you want to shed some pounds or just want to be healthy, these nine ideas will help you cut your sugar intake and can even inspire you to live a healthy life. Substitute them for your sweet cravings, add to your diet plan, and start seeing results. Let me know what you think. 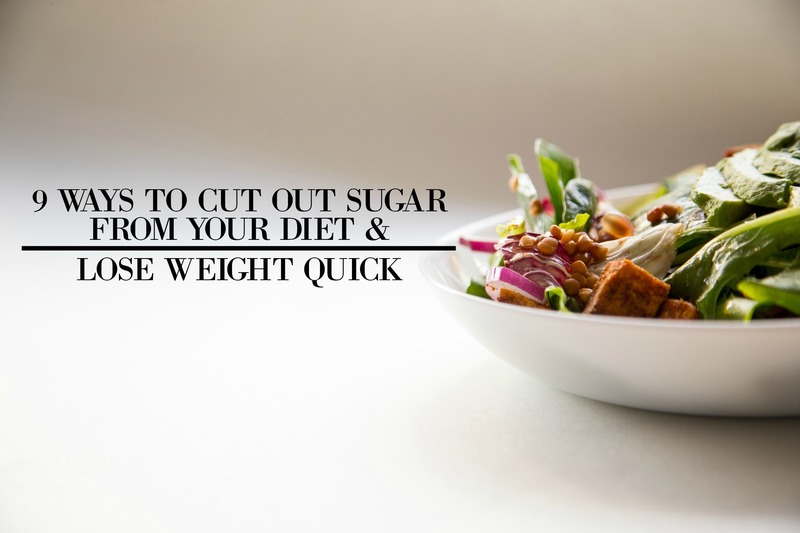 Now if you have any other tips to cut sugar intake, let me know in the comments down below! I’d love to hear about them.